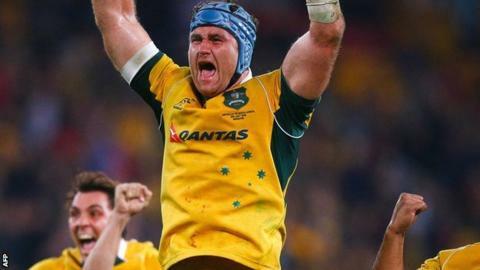 Harlequins lock forward James Horwill, the former Australia captain, is to retire from rugby union at the end of the season, at the age of 34. Horwill, who will turn 34 in the final week of the campaign, also captained Queensland Reds, as well as the Wallabies 16 times, in his 14-year professional career. He is currently in his fourth season with Quins, where he is co-captain. "I have given this great game everything I have," he said. Horwill was contracted with Quins for a further season, but has now opted to quit the game sooner. "I feel I can no longer give what is needed to play at this elite level," he said. "Rugby has been a big part of my life for many years. Never in my wildest dreams would I have envisaged the incredible journey it has taken me on. "I've had the privilege and honour to not only play, but captain my state, country and club. As part of a Harlequins side currently fourth in the Premiership table, Horwill could still end the season by helping to lift another trophy. Harlequins head of rugby Paul Gustard said: "James is a true warrior of our great game, the ultimate professional and someone you always want on your side. "It's been an honour and a pleasure to work alongside him at Harlequins. His resilience and character have made him the role model he is and will continue to be long after his retirement. "Every week he puts his body on the line and stands up to be counted alongside his team-mates. He is a very popular member of the squad, whom we will all miss." 2006 - Professional debut in 2006 for the Queensland Reds. 2007 - Won the first of his 62 Australia Test caps against Fiji. 2008 - Made captain by Queensland Reds, for whom he made 120 appearances. 2011 - Led the Reds to their first professional title, beating the Crusaders in the Super 15 final. 2011 - Named captain of Australia for the Rugby World Cup in New Zealand. 2013 - Cited, but then cleared after being accused of stamping on Alun Wyn Jones in first Lions Test. 2014 - Left out of Australia squad for 2015 Rugby World Cup. 2015 - Signed for Harlequins, for whom he has so far made 66 appearances. 2017 - Named as club captain by Quins. 2019 - Final game at The Stoop will be against Leicester on Friday, 3 May.